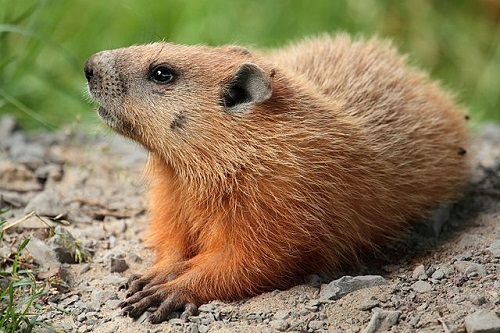 The groundhog is one of the 14 species of marmots. Its species name is Marmota monax, and it belongs to the Marmota genus, Scuiridae family, and Rodentia order. Its higher classification includes the Animalia kingdom, Chordata phylum, and Mammalia class. The groundhog or woodchuck is the largest member of the squirrel family. It is characterized as a ground squirrel that can climb trees and swim in water. They are considered as garden pests, since their diet consists primarily of plants like grass, fruits, agricultural crops, berries, and tree bark. However, they are also known to eat insects, grubs, caterpillars, snails, and grasshoppers. Groundhogs or woodchucks are common in North American areas such as the United States, Canada, and Alaska. Unlike their fellow marmots, they are lowland creatures with short but powerful limbs and curved, thick claws for digging. Their spine is curved, and they have two coats of fur. They are also equipped with two large incisors. Groundhogs are famous because they are one of the few animals that undergo complete hibernation during the winter season. During the summer, groundhogs eat all season to accumulate body fat. When winter comes (usually October to April), they escape to their burrows, curl into a ball, and slow their heartbeat and lower their body temperature. During hibernation, the stored fat gives them all the necessary nutrients. This hibernation ends at the start of spring. Spring during the months of March to April also signifies new life for the groundhog – a litter of six newborns is usually born at this time of the year. Aside from being a hibernation spot, a groundhog’s burrows are also the ideal place for sleeping, raising young groundhogs, and escaping predators like wolves, coyotes, foxes, bobcats, bears, large hawks, owls, and dogs. A groundhog’s burrow has a number of entrances and exits, which makes it a perfect escape route from predators. Burrows are often found in forest edges near open fields like meadows, roads, and streams. A groundhog would usually serve as a guard to the burrow. A high-pitched whistle from the outside is an indication of an incoming predator and danger. The groundhog can also produce other sounds like low barks as well as a sound produced by grinding its teeth. The word “woodchuck” is associated with the groundhog due to fact that the Algonquian name for the groundhog is “wuchack.” From there, it evolved into “woodchuck.” It has been the subject of a famous tongue twister and a day dedicated to the animal. 1.A groundhog is very similar to a woodchuck – they are basically the same animal, the only difference being the name. The term “woodchuck” is derived from “wuchuck,” an Algonquian name for the animal. 2.Since groundhogs and woodchucks are the same, they belong to the same classification of kingdom, phylum, class, order, family, genus, and species. They also have the same appearance, behavior, diet, and other characteristics. 4.Groundhogs live in burrows – multi-purpose areas for sleeping, hibernating, and safe shelter for the young. 5.Groundhogs are excellent tree climbers and swimmers. 6.Groundhogs are the subject of a day of celebration and a famous tongue twister. Celine. "Difference Between Groundhog and Woodchuck." DifferenceBetween.net. July 30, 2017 < http://www.differencebetween.net/science/nature/animals-nature/difference-between-groundhog-and-woodchuck/ >.